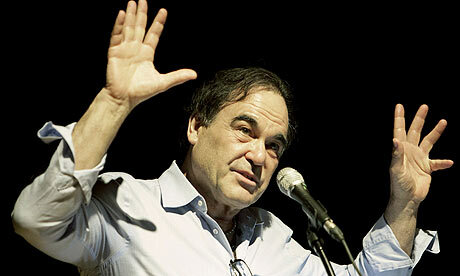 Adolf Hitler was aided in his rise to power by western bankers who appreciated his tough line on communist agitators and worker power, Oliver Stone told reporters in Bangkok yesterday. Following on from the comments he made to TV critics in Pasadena earlier this month about his upcoming 10-hour TV documentary on The Secret History of the United States, the film-maker said the German dictator had seduced the nation's military industrial complex with his ambitious promises. In the Thai capital to deliver a lecture to high-school students on the role of film in peace-building, Stone said: "Hitler is a monster. There is no question. I have no empathy for Hitler at all. He was a crazy psychopath. "But, like Frankenstein was a monster, there was a Dr Frankenstein. He is product of his era," he added. The Oscar-winning director said his documentary, made in collaboration with two historians, was aimed at providing an analysis of 20th-century history that might be useful to Barack Obama. "What has America become? How can we in America not learn from Germany in the 1930s?" he asked. The director of Platoon and Born on the Fourth of July is certainly no stranger to kicking up a storm in his four-decade long career, as he admitted himself earlier in the day, when he told about 300 students that 1991's JFK had been his most controversial film, due in part – he felt – to America's reluctance to accept that its head of state may have been assassinated by anyone other than Lee Harvey Oswald. The film centred on claims by New Orleans district attorney Jim Garrison that the president's death was part of a massive CIA conspiracy which had framed Oswald in order to cover up its own role. Garrison accused Louisiana businessman Clay Shaw of having a central role in the assassination, but his theories were thrown out by a court in 1967. "To this day, many key Americans in power are in total denial about this story," said Stone. "It is a national fairy tale. "It's an amazing story and I did it," he said of the film. "I thought I would be respected for it, and I was lambasted in the establishment press. I was called a myth-maker, a propagandist. I didn't see it coming. I thought the Kennedy murder was safe." The Secret History of the United States will be screened on the cable channel Showtime later this year.